Not sure he invented it, be probably did, but I first heard about Upper Limits from Gay Hendricks. It’s when things are better than we’re used to, and we freak out in very subtle ways and sabotage ourself so we can get back to what we’re used to. It’s definitely like that when you blow away Karma and your old Limitations aren’t there any more. Kinda scary, actually. You have to be Conscious of it, look for it, Breathe, purposely Rest, Ground yourself, and ease into it. Michael Singer, the untethered soul: the journey beyond yourself, p.121. This is the kind of thing Uranus and Eris do for lunch. It’s exhilarating, an amazing feeling, to feel our “fate” shift – you can actually see your Future changing, like a chimera on a desert highway. But most of the time we act as if we’d rather live with the Demons we know than the Grace we crave. We have to do some serious PIAVAing to reorient ourselves – but hey, Chiron’s part of the Grand Sextile – Magic is afoot! The basis of Tropical astrology is that the strongest effects relate to the Seasons – Aries being the first month of Spring, Cancer the first month of Summer, Libra the first month of Autumn, and Capricorn the first month of Winter. Much of Tropical astrology follows pretty easily from that – we see spontaneous Creation happening everywhere in Aries, Moms nurturing their new offspring in Summer, folks beginning to think about Collaboration in Autumn, and getting serious about it in Winter. Of course that’s all on its head in the Southern Hemisphere, but the Colonial European mind hardly noticed that. An honest Tropical Astrology for the South would start Aries on September 21, though of course it would be Both/And. We go through all that because once we realize we’re looking at the planets from this perspective, we see that we can watch the Planetary Cycles unfold in the Night Sky. We need one more piece of information, though. The planets (including the Sun and Moon as “planets”) move from West to East. It’s the Earth that spins the other way. So the Sun and Moon appear to move from East to West because what we’re seeing is the daily rotation of our own Planet. If we want to watch the other planets move in the sky, we need to take a fish-eye snapshot of the Sky every night at midnight. Arranging those snapshots as a time-lapse video, we’d see the motion of the planets as seen from Earth. In that video we’d see the Stations and Retrogrades and Cycles. So, getting down to Cycles on our imaginary midnight time-lapse video, we’d see the red planet Mars trotting across the Sky and returning to the same benchmark location every two years. The fourth-brightest object in the Sky (after Sun, Moon, and Venus) is the white planet Jupiter. It would take twelve years for Jupiter to make one complete journey across the Sky and return to the same benchmark. Of course they’d be invisible half the time, because they’d be on the other side of the Earth. So Mars will make six round trips for each of Jupiter’s round trips, and we can watch Mars pass Jupiter in the Sky every two years. In real life it turns out to be two-and-a-half years for Mars to catch up again with Jupiter, because in the two years while Mars was looping, Jupiter was moving too. So the next Mars-Jupiter Conjunction – or Jupiter-Mars Initiation – will occur further along in the Zodiac (later in the year) than the last one. When Mars passes or Conjuncts Jupiter, we refer to it as Jupiter Initiating Mars. The reason we do this is because we aren’t really looking at the planets, we’re looking at Energies they represent. It’s an ancient and very useful tradition to personify Energies and Entities. “Moderns” consider that a horribly primitive and “superstitious” thing to do, but they do it all the time, when they personify one another and their exploitative gods like Free Market and Cause & Effect. Everyone has their Mythology, and when you hit a nerve in conversation with someone, you know you’ve stumbled onto Mythology that they’re Fundamentalist about (that is, they assume their metaphors are literally True). As if Truth were knowable! If they had any sensitivity, they could see that Trees and Rocks have just as much Life and Individuality as they do, and have a lot more to say than they do, if for no other reason than the Trees and Rocks have been around a lot longer. If you personify your car, it’ll be more reliable, last longer, and tell you when it needs help. It’s simply a matter of Respect to personify everything. Do we really think the Wind will talk to us? Don’t be silly, if we did we’d be a nutcase, right? It’s symbolic. The Wind represents an Energy, and pretending to personify it helps us to understand it. It’s a classic error of thought to confuse a Symbol with its Referent – we all do it all the time. We see a snapshot and we think of it as a Landscape. We do Google Earth and we think we’ve been there. We see a body and assume it’s a person. We see an incident and believe it’s a trend. We see a Star and think it’s an Omen. But of course it’s Both/And. And since it’s all a hologram anyway, the only difference between the Symbol and the Referent is the quality of the projector. How incredibly arrogant to think that the Wind doesn’t talk – and listen! You just stay out of the nuthouse (if you want) by telling people what they need to hear so they don’t freak out. Either/Or people have very fragile Egos that are threatened by anything outside their narrow Birdcage. So we personify Mars as a whippersnapper running around Doing a lot of stuff and kicking up a lot of dust in the process, and we personify Jupiter as a more stable source of Wisdom and a symbol for Expansion. These personifications aren’t arbitrary; they’re based on millennia of observation. When Mars is lit up, often so are tempers. But of course that’s self-reinforcing; if we know Mars is lit up and we see someone coming with a fresh Sunburn, we might think they’re really angry and run away – or strike first, just in case. And the traditional astrological interpretations are laced with millennia of negative Either/Or thinking, which we need to discount. 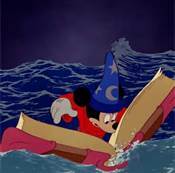 So we see Jupiter as the Wizard, and Mars as Micky Mouse running around trying to replicate the Wizard’s tricks while supposedly doing the Wizard’s bidding. 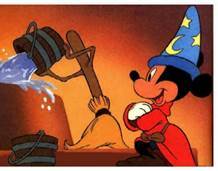 Or, since it’s always Both/And, you could see Micky as Jupiter and his broomsticks as Mars. Either way, as we all know, delegation leads to trouble. But the point is that in astrological Cycles there is a faster planet, the Delegatee, and a slower planet, the Delegator. At the beginning of a Cycle, the Delegator Initiates the Delegatee, or assigns a task to the Delegatee, or confers Shaktipat to the Delegatee. Over the course of the Cycle, the Delegatee attempts to carry out the task. We usually say that the faster planet Conjuncts the slower planet, and that the slower planet Initiates the faster planet, but they’re the same thing. While slower confers Wisdom, faster provides Experience – though with less opportunity for contemplation and integration. The task, or Energy of the Cycle – we can and should personify Cycles as well – is strong at Initiation, but only for those who aren’t Denying it. Those who are heavily invested in the old Cycle that just died, and still hoping to keep making profits from it, will be looking the other way and hoping the new Energy goes away. In the 1960s, Pluto Initiated Uranus at 18 Virgo, “An Ouija board,” and there was Magic afoot. And lots of Muggles working hard to Deny it. The Guru Pluto (History personified) gave the Initiate Uranus (the Individual personified) the assignment of manifesting an Ouija Board on Earth – which we can interpret (among many other possibilities) as restoring the Realm of the Fairies, and restoring the Magic of the Human-Soul connection and respect for all Entities and Energies. Then, as the Cycle develops, the Energy becomes less obvious. Through the 1970s and Eighties and Nineties, as Uranus moved away from Pluto, Magic was a lot less apparent. Till Uranus reached its Sextile (two Signs apart – Creative Grace) to Pluto, and Harry Potter launched, to become the most popular book series ever. Harry’s mom JK Rowling was born in the mid-sixties with Uranus two degrees shy of Pluto and closing rapidly. JK has a Grand Cross (Uranus/Pluto Opposite Saturn, Square the Nodes) and a Grand Trine (North Node-Mars-Pallas) – echoes of the current now. The Uranus-Pluto Initiation itself Opposed both Saturn and Chiron (Magic and Miracles, with Focus); Harry Potter (the book launch) has Uranus Septile Chiron (double Magic) and Quintile Saturn-Vesta (Learning to Focus on the Sacred). Fast forward our time-lapse video to 2012, and Uranus comes ’round to Square Pluto. That’s when Magic becomes a part of everyday life. With Retrogrades and Repeats, the Uranus-Pluto Square repeats seven times, till 2015, so we aren’t near done yet with our Ouija board. We pay particular attention to Lilith because her these-boots-were-made-for-walking act so mirrors the push for gender equality that characterized the 1960s. In the chart of the 1965 Pluto-Uranus Initiation, Venus was overtaking Mars near the South Node, with all three Conjunct. The implication is that during the current 140-year Uranus-Pluto Cycle, our Androgyny (in the best sense of the word) will be dredged out from beneath the Emotional Holding that has been keeping it hostage. The exact Mars-Venus Initiation occurred ten days after the Pluto-Uranus Initiation, at 11 Sagittarius, “In the left section of an archaic temple, a lamp burns in a container shaped like a Human body.” That’s a very unusual Symbol, laden with potential. Left usually represents Source and consequently the Feminine. Rudhyar’s take: “The value of the ‘return to the body’ advocated by modern thinkers in order to balance the stress on intellectuality and objective consciousness.” You can see in the current trend toward oppression of Women by the Olde Male Power Structure, a desperate effort to extinguish this Sacred lamp. The Olde Male Culture is deeply invested in the Intellectual and its “objectivity” because it can define the “objective” with Logic, without ever revealing the exploitative Assumptions that underlie its Logic. Even the “religious” elements of the Olde Male are Intellectual. They’re based not on Spirit, Energy, or Emotion, but on Ideology. The Colonial perspective is all about objectifying Other. Thanks to martin for several corrections; see Comments. Well, my guess is that Eris went Retro Friday evening around 11pm PDT – my brain went ~Boing~ about then, and didn’t unBoing till Mercury went Direct the following morning. Our next event is Monday’s Full Moon – how much has changed since the Uranus Station chart? Not a whole bunch, except that the heat is off of Uranus, Eris is now Retrograde, and Mercury is Direct again – in a way, it’s like the World returning to “normal,” though as you well know, the recent normal is anything but. First there’s the Full Moon. It’s in the first degree of Aquarius, “An old adobe mission in Califormia,” or, in Rudhyar’s terms “The power inherent in all great human works to endure far longer than the workers’ life spans.” Should bode well for some seriously Cererian reforms. As we’ll see shortly, Ceres is busy these days. The Full Moon heads a Yod (Curiosity and Focus) with Pallas (Boundaries) and Venus (Values) at the tails. Then there’s the Grand Cross, with aforementioned Ceres filling in the last corner, Opposite Juno and Square the Nodes. If we’re going to make anything Sustainable (Ceres) then we need to quit with the self-sabotage (South Node) and align our Unconscious Identity (Juno) with our Mission (North Node). That’s a tall order, but a Grand Cross is a powerful motivator. Saturn-Neptune-Mars/Lilith/Jupiter – Mars has been initiated by both Lilith and Jupiter, has accepted his Mission, and is now warming up the Aston Martin. This triple conjunction is no slouch, as it signifies Peak Fundamentalism and Peak Denial. Mars, Quintile Eris, will roust them out over the next few years. ‘Ere long Pallas replaces Mars on this corner – the God of War replaced by the Goddess of War, and the campaign continues. If we label the Mars(Pallas)/Lilith/Jupiter Conjunction a Crusade (to take our Destiny back from Ideology), then it’s a first-priority (Saturn) Crusade abetted by Spirit (Neptune), with God on our Side (Grand Trine). North Node-Mercury-Chiron – cleverly (Mercury) reframing our Worldview (Chiron) to support our Mission (North Node), with Blessings (Grand Trine). But wait. We’ve been considering the North Node to be the focus of the Grand Trine, because it’s a corner of the T-Square, so we’ve been focusing on our Mission. But if the North Node’s in a Grand Trine, then the South Node makes it into a Kite, which puts the focus on the South Node! My apologies to those of you who’ve been struggling with old Limiting Beliefs as your Karma demanded to dance. But over decades of doing this I’ve seen that errors and oversights don’t occur by chance – they’re part of the channeling. So I have to say that from here forward we’re going to have to get more serious about facing our Emotional Ring-Pass-Nots, surrendering our Victims, Loving our Limiting Beliefs to death, and adding new rooms to our Birdcage. I could guess that it’s Mars’s new Mission that marks the Change. 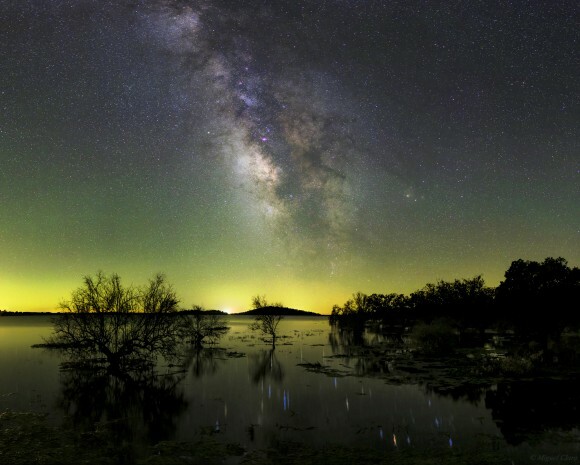 Another gorgeous Milky Way photo by Miguel Claro. 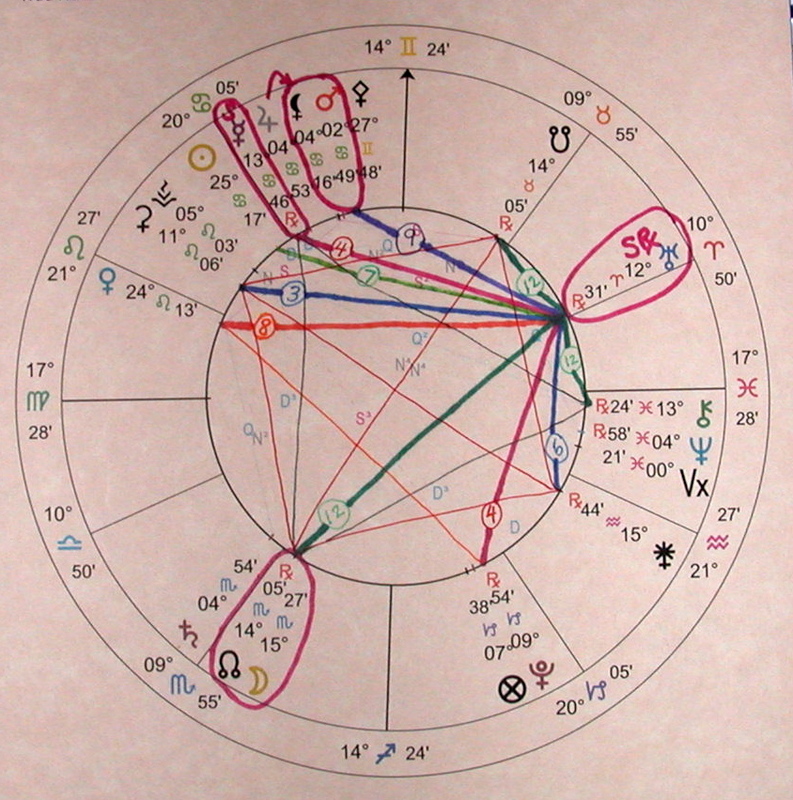 The Grand Cross is drawn in with thinner red lines, and the Grand Trine with thinner blue lines. Uranus relates to all four corners of the Grand Cross – Trine (Third Harmonic) to the Ceres corner, Quincunx (Eighth) to the North Node corner, Sextile (Sixth) to the Juno corner, and Semi-Sextile (Twelfth) to the South Node. And to all three corners of the Grand Trine – Quincunx to the North Node, Square to Mercury (Fourth), and Semi-Sextile (Twelfth) to Chiron. 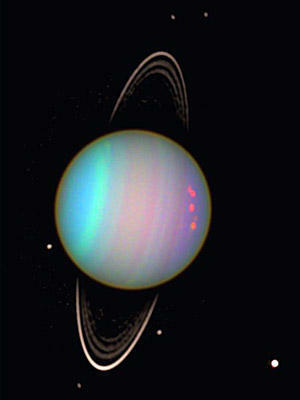 Uranus isn’t in either of the Grands, but you can think of it as the conductor behind the scenes. The Great Manifester (and Authenticator! – Uranus’s henchperson here in the lower Dimensions), the Moon, sits on the North Node, directing our Attention very clearly to that corner. The Grand Cross, which was exact while Saturn was Stationary earlier this week, is about making permanent (Ceres) the Changes (Nodes) in our Unconscious Identity (Juno) that have been occurring for a while now, Changes that will liberate us from our Karma (South Node) so we can more effectively Manifest (Moon) our Mission (North Node). The tension (it’s a Grand Cross after all) involves releasing what we’re attached to, that we no longer need, particularly the Karma part. The Grand Cross sits on the Midpoints of the Fixed Signs, which symbolize the Four Horsemen of the Apocalypse. Like the Solstices and Equinoxes, the Midpoints of the Fixed Signs epitomize the Grand Cross. They are celebrated by the Cross-Quarter Days, the other four Pagan Holidays. Because of the Precession of the Equinoxes and other anomalies, the Fixed Stars representing the Four Horsemen are no longer at the Midpoints of the Fixed Tropical Signs. But the symbolism remains. Like the Mjolnir, the Four Horsemen represent Challenges that result in either Great Success or Great Failure. The Star Aldebaran and the Holiday Beltane or MayDay symbolize the Midpoint of Taurus. Beltane, like Samhain (Hallowe’en), is a time when the Faerie or Spirit Dimension is close to ours. Beltane celebrates Fire. The Challenge that Aldebaran brings is Integrity. While the South Node, at the Taurus Midpoint, is about Karma or obsolete Patterns, it’s also about the Lost Skills that are hidden beneath our Karmic Emotional Holding – the Light of Authenticity would be a good candidate. Ceres sits near the Midpoint of Leo. Ceres stands for that which Sustains us, what is permanent, and illuminates the excesses in our Desire. The Holiday Lammas celebrates the first harvest of the summer – often with grain. Ceres as in Cereal – another multiplication of independent forces. The Star Regulus presents the Challenge of Revenge. The combination symbolizes Responsibility – the willingness to accept and repay all of our legitimate debts cleanly and respectfully. The Midpoint of Scorpio is Samhain, celebration of Spirit and Death. The Challenge of its Star Antares is to Defy Death. You can see the reflection of Antares as a short red streak in the lower right of Miguel Claro’s photo. If you scroll down on the link, he traces out the entire Scorpius constellation in the reflection. The North Node occupies this Midpoint, signifying that our Mission is not without meaningful Risk. 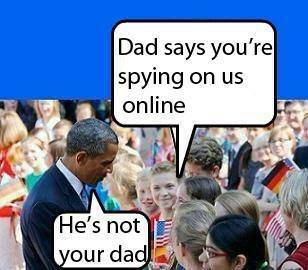 We knew that, actually. The Midpoint of Aquarius is represented by Brigid and the Star Formalhaut. Brigid celebrates the Return of the Light after the darkness of winter. Formalhaut symbolizes Purity of Ideals as the blade on which success and failure balance. Here we have Juno. The plotline is about purifying our Unconscious Intention, so our Conscious Intentions are no longer sabotaged by our Evil Twin. While Uranus, being Stationary, is the clear Leader in this horoscope, the North Node, as the corner shared by both the Grand Cross and the Grand Trine, is the clear contributor of meaning. The Nodes run from 15 Taurus in the South (“Head covered with a rakish silk hat, muffled against the cold, a man braves a storm“) to 15 Scorpio in the North (“Children playing around five mounds of Sand“). Giving up on the Male Ego, industriously proud of his Doingness and Bravado, and regressing back to a simple Childishness, Playfulness – we can even call it Authenticity, Instinct. Why Sand? It’s elemental, fundamental, uncomplicated, simple, ancient. Every Beach is different, but much of the Planet’s Sand is Quartz, as being hardest, that’s what’s left when everything else has been ground to dust. 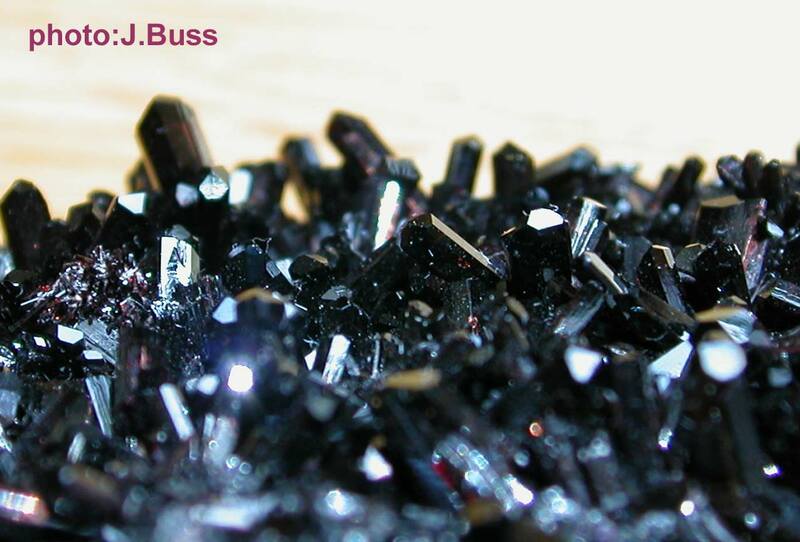 Quartz, the great Healer, the great Amplifier of the Energies in other Stones. Healing back to simplicity, without guile, guided by Instinct rather than figuring it out. Why Five? Five is the number of Learning, and clearly much of Humanity will need a lot of Learning to reach Simplicity. But Five is also, as Rudhyar points out, the number of Venus, of the Sacred Rose and the pre-Intellectual Apple, of the Pentagram, of Magic. Venus is the focus of the Mjolnir with the Uranus-Pluto Square, and the Uranus-Pluto Square is the fundamental underlying Energy of 2012-2015. Five is also the number of the additional Dimension we need to fathom if we are to thrive after the End of Time – perhaps the Faerie or Spirit Dimension. The Grand Trine involves the North Node, Stationary Mercury, and Chiron. That’s remarkable, as it contributes great skills, operating effortlessly, to our Attention to our Mission – Chiron’s ability to reframe Despair into Miracle by changing the frame of reference, and Mercury’s ability to analyze, draw and test hypotheses, and maintain Awareness. Embedded in all this is a Pythagorean Triangle – a Configuration combining a Square (Challenge), a Trine (Grace), and a Quincunx (Curiosity) – the Third Harmonic (Love with Wisdom), the Fourth Harmonic (Healthy Control), and their product the Twelfth Harmonic (Pattern-Breaking). Nice combination. The corners are the Uranus Station, the North Node, and Ceres. By permanently (Ceres) allowing our True Self (Uranus) to show through, moment to moment, our Mission (North Node) becomes effortless. Not to forget all the trimmings though, as they’ll add color to the picture. As you can see from it’s rings, unlike its planetary mates, Uranus’s Axis of Rotation is perpendicular to the plane of its orbit. Everybody else spins with their equator more or less aligned with their orbit and their Poles above and below their orbits. Uranus spins with its equator at right angles to its orbit, and its “poles” aligned with its orbit. Hard to call them “poles,” because we think of the poles as colder, not just as the places where the stick that the planet spins around protrudes. It’s a clever strategy, because rather than having its poles be permanently colder than the rest of the planet, temperatures on the planet would be more evenly distributed. Not that this would help folks of our ilk, as the average temperature is around -350F/-200C. First, we’ll be using four degrees of Orb here, which I believe is fine (one to three is usual for this type of astroanalysis) because we’re looking at some pretty intense phenomena. However, it means that less-sensitive individuals may miss some of what’s going on – but I guess that won’t be unusual. I’ll flag the four-degree Orbs. Second, recall that the combination of a Grand Cross and a Grand Trine creates a great chart, as the Motivation in the Grand Cross is balanced by the Grace in the Grand Trine, and the potential Arrogance in the Grand Trine is intercepted by the Challenges of the Grand Cross. It’s busy, not a lot of rest involved, but it’s balanced enough that it doesn’t usually feel onerous. We’ll come back to this later. And third, this is the second of several posts about next week. The first is Mars-Jupiter-Lilith July 11-22. The third is mostly about the Grand Cross (and Grand Trine). The fourth will be about the almost-simultaneous Eris Station. There may be more. It makes Twelfth-Harmonic Angles (one Sign) to Chiron and the South Node – what a Blessing, as the Twelfth Harmonic is about Pattern-Breaking, Chiron is about shifting from Despair to Miracle, and the South Node is about our Karma! Sounds like Liberation! Uranus also makes a different Twelfth-Harmonic Angle (five Signs or five twelfths of the Zodiac, called a Quincunx) to the North Node. A Quincunx is about Curiosity because it combines Twelve (Pattern-Breaking) with Five (Learning). So we can expect to be Curious about our Mission and our Future, which is far far far better than Expectation! Our Mission is like “God” in the sense that it’s unknowable, ineffable, and far too complex and straightforward and multidimensional and esoteric and subtle and monumental for us as humans to comprehend, at least under “normal” circumstances. Since Uranus is Stationary now (today it’s within the same arcminute as it’s Station – an arcminute is one 60th of a degree; it takes 21,600 of these to fill a circle), these Angles tell us what Opportunities we’re likely to be experiencing now. They’ll also color the Uranus-Retrograde period, which spans July 17-November 17. Taking advantage of just these two Opportunities would allow us to be ready to leap into the fray prepared when the Grand Trines end in October. The Nodes are involved in a Grand Cross with Juno and Ceres (though with four-and-a-half degree Orb), and a Grand Trine with Mercury and Chiron, but we’ll go into that a little later. 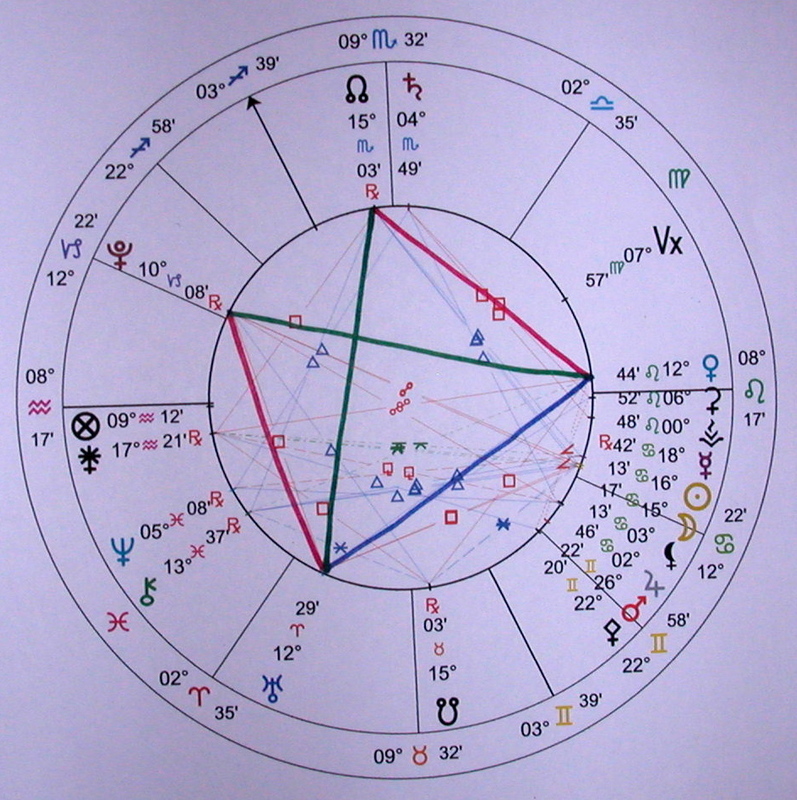 Uranus’s Twelfth-Harmonic Angles to the Nodes link it closely to the Grand Cross and the Grand Trine. Because there was so much to say, we talked about the Ninth-Harmonic Angle from Uranus to Mars-Jupiter-Lilith in a separate post, Mars-Jupiter-Lilith July 11-22. Uranus makes an Eighth-Harmonic Angle to Venus. The Eighth Harmonic is about returning to Balance. Venus is our natural sense of Beauty, Right and Wrong, and Integrity. Our Natural sense, not our programmed ideation. Venus is in the process of making a Mjolnir with Uranus and Pluto, complete around 2am PDT on July 19 – we’ve got some serious Portals coming up here. Pretty intense, with the Magic of Venus and the Power of Pluto behind it – this could be a major millstone of the 2012-2015 Uranus-Pluto Square. Makes Disruption seem trivial. Uranus’s Seventh-Harmonic Angle (Shamanic or “Soft” Power) is with the Sun (Source). Time to PIAVA. Don’t try to Power through it all the old Male way, Open up to what there is to Learn. Just PIAVA a gentle and loving transition – you’ve no need to fear the eventual results, as everyone will be better off except those who are unable to let go of what’s obsolete. Saturn’s recent Station was on the cusp between the Scorpio and Sagittarius segments of Scorpio – the place where we lighten up a bit on our compulsions, so letting go should get easier as Saturn resumes its journey. The Sixth-Harmonic Angle (Partnership) from Uranus is to Juno (Unconscious Identity). As you know, Juno’s been in a long-term T-Square to the Nodes. If it’s now in Partnership with Uranus, this implies that we may begin noticing that we’re reacting differently – with less self-sabotage – to things that used to evoke internal conflict for us. And as we mentioned, Ceres now completes the Juno-Nodes Grand Cross, which we’ll talk about soon. Our famous Uranus-Pluto Square (Fourth-Harmonic Angle) is T-Squared by Mercury, which will Challenge us to bring our newfound Authenticity into Open Awareness. This T-Square was actually complete in early June, before Mercury went Retrograde. Mercury doesn’t back up far enough to Oppose Pluto, so the Configuration is a mere shadow of its former self. It will have an impact here, but a minor one. Nevertheless, it’s another Opportunity for us. At its Station Uranus Trines (Third-Harmonic Angle) Ceres, so the Changes that Uranus invites – like it or not – will be permanent. As we said, the Changes will ultimately benefit everybody, so if there’s Disruption – or Devastation – go with the flow, and adapt as best you can. You’ll be delighted with the ultimate result. Which brings us to the Grand Cross – which we’ll cover in the next post. It’s hardly possible to summarize all this Action in a few kernels, and besides, we have to explore the Grand Cross and Grand Trine first, because they’re so intimately involved. And don’t forget that Eris is also Stationary a few days later, so we aren’t feeling just Uranus here. Next Wednesday’s Uranus Station makes a Ninth-Harmonic Angle to Mars, Jupiter, and Lilith. The impending Lilith-Mars Initiation (1am PDT July 20) at 5 Cancer (“At a railroad crossing, an automobile is wrecked by a train” or as Rudhyar says, “The tragic results when an individual’s will pits itself carelessly against the collective will of society“) begins a two-and-a-half-year Cycle. Lilith (pre-Intellectual Instinct, Equality, Collaboration) is the Initiator here, Mars (Action) the Initiate. If Action is frustrated, Mars can manifest as negative Emotions and destructive tendencies. Her recovery and obvious Calling makes you believe that it’s Olde-Male Chauvinism that’s the wrecked automobile, not Malala. In the US, the Olde Males are running roughshod over women’s rights in state after state – is this a defensive reaction to the demise of Olde Male suzerainty, or just another crude chest-thumping Power-Over? The next couple of years may tell us whether the collective will of society is getting off the Olde-Male train or not. Lilith, banished from polite society in the Book of Isaiah, represents the Shadow of Male-dominated culture – Shadow in the Jungian sense, namely that which is repressed. The Lilith-Mars Initiation takes place while Mercury is Stationary, implying the likely eruption of repressed contents into Consciousness. Repressed material seldom leaks out, it more often erupts – train-wreck style, as texts on mental health describe in great detail. “Mental health” in Male-dominated cultures, that is. When you see your Shadow, be mindful not to overreact. We integrate our Shadow by embracing it. That’s really all you need to do, open up space to be Loving with it, though if Shame or Guilt or Anger or Fear arises in the process, it’s even more important to be loving and gentle with that. “Good” is as unproductive a word here as “Bad” is – you want to move toward Wholeness, not toward Good. If there is conflict between your sense of what’s Right and your acknowledgment of your “Bad,” give yourself permission to Forgive. You don’t want to isolate or eliminate the Bad to make room for more Good – you want to examine your motives for the Bad, to see how you can adjust your Actions and Words to be less hurtful to others and to yourself, but still fulfill your motives. Flipping 100% leaves you on the same Coin – no Change. A 10% shift will give you new perspectives and put you on a new playing field, where you have more Healthy Control. It would be instructive to see what the Mars-Lilith Cycle has been up to for the last couple of years. That would be 2 Aries, “A comedian reveals human nature” (April 2011). That’s certainly an illuminating way to look at the events of the last few years, isn’t it. The implication is an increase in Consciousness. Even if it means Acceptance rather than Change, it’s still great progress, as Acceptance is actually much more effective at Pattern-Breaking than trying to Change. Once we have Acceptance, we have Choice. The Ninth Harmonic is about Contemplation, Introspection, Inspiration, Integration, Wholeness, and Wisdom. The combination signifies an intense couple of years, as Lilith erupts, with Uranus standing behind her to Disrupt whatever is stagnant. Pre-Intellectual Instinct is a critically important part of the Authenticity and Yintegrity that Uranus requires – and Lilith and Uranus are independent Energies. When two independent Energies are both triggered, their impact is multiplied. The Mars-Jupiter Initiation occurs at 12am PDT July 22, at 6 Cancer, “Game Birds feathering their nests,” or in Rudhyar’s view, “An instinctual dedication of self to new forms of life.” An open book? This would seem like a disadvantage of pre-Intellectual Instinct, as the Game Birds prepared for the next generation even as they themselves are destined for the oven – blind obedience to an old Pattern, without the Consciousness to Awake and Change the Pattern. The Mars-Jupiter Cycle is about Action in service to Expansion. The prior Mars-Jupiter Cycle began on MayDay 2011, Beltane, Conjunct Eris at 23 Aries, “A pregnant woman in a light summer dress.” Eris would have had women telling it like it is. While Jupiter and Lilith Conjoined on July 11 (the day before Malala’s speech), that was their fourth meeting of five. The Initiation occurred in December 2011, at 1 Taurus, “A Clear Mountain Stream,” or in Rudhyar’s view, “The pure uncontaminated and spontaneous manifestation of one’s own nature.” Couldn’t get much more relevant to a Uranus Station! Jupiter-Lilith is a 35-year Cycle. The previous Initiation was in January 1978, at 29 Gemini, “The first Mockingbird of Spring.” Mockingbird is to Spring as Rooster is to Morning – this was about waking up. And making noise, sounding the alarm. I’m not sure that this characterizes Women’s Rights in the 1978-2011 span though. In many ways the post-Watergate era for most people was about knuckling down and adjusting to both-parents-working, while incomes and prosperity peaked and began to fall. How would the prior Cycle have motivated Rosie the Riveter? The January 1943 Initiation was 18 Cancer, or “A Hen scratching the ground to find nourishment for her progeny.” Fitting for the Self-abandonment of the Mad Men era as well, and if you postulate that the Feminism of the 1960s was motivated primarily by a desire for equal pay, maybe for the These Boots Were Made for Walking age as well. We can’t help but blame other people for the ways we don’t have permission to be our True Self, and often it’s people we Love or Depend upon. Next week we get to tell them off. It’s important to get this out in the open. Don’t tell them off with the intention of pushing them out of your Life. Tell them off with the intention of being Honest about what you really feel. If you “hurt their feelings” in the process, apologize for that, and ask them to tell you how they really feel. Don’t candy-coat anything, but use the opportunity to deepen your relationship with them. With Uranus, Eris, and Mercury all Stationary next week, the Mars-Lilith-Jupiter complex will open up tremendous opportunities for Collaboration, and Collaboration is probably the most important commodity lacking on the Planet in this time. Eris turns Retrograde toward the end of next week, in 23 Aries, “A pregnant woman in light summer dress.” It’s already Standing Still – that is, Strong. Eris is in this degree for more than half of 2013, so it may behoove us to spend a little time with the vignette. Rudhyar refers to Fecundity, or Potentiality. Pregnant in a light summer dress to me speaks of having nothing to hide – fitting for Eris, and especially fitting given that Uranus is Stationary at the same time. Like Mark Twain said, “If you tell the truth you don’t have to remember anything.” Wouldn’t it be great if we could just give ourselves permission be our True Self all the time? Well, maybe not, maybe we should use the 10% rule, and PIAVA that we have permission to be our True Self 10% more often. If we started at being our True Self 1% of the time, and reissued that prayer every day, we’d be 100% True Self within two months. That’d definitely trigger our Upper Limits – the natural Fear that occurs when we go too far too fast. Maybe it’d be better to give ourselves a year – that’d mean praying for 10% more Authenticity just once a week, or 2% a day. By October, when the Grand Trines end, we’d be well over 50%, and I suspect that’d make it a lot easier to cope with the new Dimensions. The Uranus Station occurs at 13 Aries, “An unexploded bomb reveals an unsuccessful social protest” or, by Rudhyar’s take, “An immature evaluation of the possibility of transforming suddenly the status quo.” Yep, sounds like we should give ourselves at least a year to eliminate Denial and Inauthenticity. Oh, and don’t forget to PIAVA a gentle and loving transition, and a gentle and loving release of all impediments. Many of us believe that Inauthenticity is necessary for Survival, and if we don’t disarm that Fear of Authenticity, we’ll end up going backwards. “A massive rocky shore resists the pounding of the waves” is the symbol for 5 Scorpio, where Saturn is Standing Still and about to go forward again, at 10pm PDT on July 7. Saturn, recall, is about Focusing on Priority Number One. If Saturn feels limiting or stressful, it’s because you’re trying to hold on too tightly to secondary priorities. Let them go – for now. They’ll have their own season, but for now you need to Concentrate on the One Most Important Thing. When I studied time management, that was the cardinal rule – always focus on the Most Important Thing. Of course, that’s worthless unless you’re consistently able to Intuit what the Most Important Thing is. You have to Intuit it, not think it. Thinking about the Most Important Thing is only good for discovering your hidden assumptions, the ones that sabotage you – of course, if you haven’t done that yet, maybe it is the Most Important Thing you can do. But in order to keep your Intuition on target, the minimum requirement is that you stay relaxed. So most of the time it turns out that the Most Important Thing is to stay relaxed. Probably why meditation is so effective, let alone Tapping. Scorpio is about Getting to the Bottom of Things. It’s Intense, in Scorpio the Most Important Thing is always Getting to the Bottom of Things. No unturned stones here. Five degrees of Scorpio is right at the end of the Sagittarius chunk of Scorpio. That’s the place where we’ve long since noticed that by being so Intense we were sabotaging our efforts to Get to the Bottom of Things, so in the Sagittarius chunk we’ve tried to lighten up. In our methods, not our Intention. Here at the end of the Sadge segment, we’re about to enter the Capricorn portion, where we really get serious and take an engineering approach to uncovering the Bottom of the Most Important Thing. Even though this Stationary Saturn – planets are at the Strongest when Stationary – has been dominating the airwaves for the last few weeks, Uranus and Eris are also Stationary. Their Stations are 10-12 days off, but they’re each only a fraction of a degree from their Station positions, ie, moving verrry slowly, ie, verrry Strong. So we can make a good case that the Most Important Thing here is likely to have something to do with Confronting Denial (Eris) about our True Self (Uranus). If you’re Focusing on other people’s Denial, you’re on the wrong page. Its important when we turn around a Projection that we don’t just replace it with a Judgment. If your boss makes unreasonable demands, don’t get down on yourself for being impatient about whatever you get impatient about. A Projection is no different from a Dream. When we have any Insight into how we sabotage ourselves, it never works to do the opposite of the sabotage Pattern. We have to keep the basic Pattern, but adjust it by five or ten percent, in a direction that’s a little less self-sabotaging and a little more likely to produce what we Want. If we just flip to the Opposite, we’re still on the same Coin. But a tangent can take us to new perspectives and potentially Miracles. The New Moon occurs only two hours after the Saturn Station. That will stretch the Saturn-Station Energy out for a month or so. Saturn and the New Moon are Tridecile to one another. That’s three tenths of the way around the circle. The Tenth Harmonic is about Fortune – through willingness to change and to take risks on new opportunities. Which mirrors the Big Grace inherent in the ongoing Saturn-Neptune-Jupiter/Lilith Grand Trine – the growth in Female Power. What we read and hear about in the corporate media is the prominent Resistance to that. The only other prominent Angle made by the Saturn Station is a Biseptile (two sevenths of the loop – Magic) to Juno. The Angle to Juno says that Magic is Afoot if we’re willing to take risks on new opportunities – the tangent again. Of course Juno is still Square to the Nodes, representing significant changes in our Unconscious Identity – either so that we’re more aligned with our Lifetime Mission and more actively releasing our Karma (if we’re Awake), or so that our face is getting rubbed in our Karma (if we aren’t Awake, in an effort to Wake us up). Given that we’ve been working on this for several months now, it’s an excellent candidate for the Most Important Thing, though since it’s Unconscious, and since our Mission is probably not very knowable (as it’s far more multidimensional that the mind can grasp), many of us won’t see the connection. Those Nodes are the busiest places in the Saturn-Station/New Moon chart, along with Venus. The North Node forms a second Grand Trine with Chiron and the New Moon – which by the way is Conjunct Mercury. More Big Grace, and Magic available to us. We find the Magic by facing where we believe our Mission will take us, and turning very slowly until we feel the click as we find the correct direction for our next step. Which doesn’t mean the step after that is in the same direction – you have to repeat the slow-rotate-till-it-clicks after each step. Or you’ll run headlong into a tree. An example would probably behoove here, as we’re using a spatial metaphor to stand in for a multidimensional process. Suppose you’re bored with your job, or scared about not being able to find one. Turn very slowly until we feel the click means to alter your fantasy slightly, repeatedly, and watch to see how it feels in your body. Maybe you first try being paid for doing what you love, but that doesn’t feel fair. So you turn slowly again, maybe trying being paid while doing what you love, and that feels better, but the Dream falls out of the sky because you have no idea who would pay you or why. Turn slowly again, and maybe stumble onto the idea of living in Community with someone who has a knack for generating cash while doing what they love and loves to share it, someone who loves to grow food and cook it, and someone who loves sharing their house – all of whom deeply appreciate what you love doing. Then later, we catch ourselves thinking about all the downsides of our notion – that depression business. Write down each downside and flip it to what you do want. You aren’t sure you’ll like living communally – maybe the flip side of that is a need for privacy. Okay, so the house is roomy enough for everyone to have their own space. Et cetera. This Future-building process can go on for a long time, as well it should, since you don’t want a flimsy, tossed-together Future after all. At each step you need to give up your Expectations. This isn’t about returning to the Womb, it’s about Living your Mission in a practical, workable, imaginative way. Does that help clarify? Once you do this enough (which could be years), your Future will begin manifesting on its own. In fact, each time you turn slowly, your Future changes. You just can’t see it yet. In addition to the Juno T-Square, Venus is also T-Square to the Nodes. It’s not a Grand Cross because Venus isn’t opposite Juno yet – it will be by Wednesday, but not for the Station/New Moon. That’s kind of a unique situation, where our Values get adjusted, but we don’t yet see the relationship to our Identity. Probably designed to minimize our intellectual interference. Venus is also the Focus of a Yod with Pluto and Chiron – implying that our Attitude Adjustment isn’t optional, and will seem Miraculous. If you catch your Attitude tending toward depression, be mindful that you’re looking at Chiron, and that Miracles await if you’re willing to release your Expectations and try the slow-rotate trick. This is pretty slick, as it combines an element of our ongoing Unconscious Reorganization, namely our Attitude-adjusting Venus-North Node Square, with the Uranus-Pluto Square – which remains the Biggest single astrological relationship that we’re dealing with. We talk a lot about the accoutrements, but the Chiron-Neptune Initiation (a New Paradigm) and the Uranus-Pluto Square (I gotta be Me) still represent the biggest trends in our Conscious and Unconscious Worlds. Curiosity about how our Values will be reframed to allow us to release our programming without Guilt, Shame, or Resentment (Venus-Pluto Quincunx). AND remembering that Confusion is the first stage of Growth, and being okay with Sitting Still while in Confusion and not having to fix it or figure it out. All this is so important because we’re surrounded by Grace right now, with these Grand Trines, and they go away in October. By then we want to be pretty adept at handling these new Post-Time Energies, so we can fly on our own when we’re kicked out of the nest! Vesuvianite is a very powerful Healing Stone, used in all manor or Psychic Surgery – and believe me we’re in the middle of Psychic Surgery! Not surgery on our Bodies done through nonphysical dimensions, but surgery on our Psyches so we can appreciate the extra dimensionality of our Post-Time venue. In these Crystals some of the Magnesium that would normally be in Vesuvianite has been replaced by our old friend Manganese, hence the reddish tints here and there. Manganese mops up ancient wounds and bruises, clearing our Consciousness so we’re more prepared for the Present Moment.